I try to keep my guest list for Thanksgiving “vegan free” but that doesn’t work for everyone. I’m just kidding! I love vegans – one of my best friends is a vegan. If they want to bring over the Tofurkey – then they can spend Thanksgiving at my house which is a bird, butter, and pie festival. This is a very fast way to dress up spinach and with the ability to buy a bag of pre-washed spinach – a snap to make. I couldn’t find fresh spinach to wash at my supermarket and ended up buying a bag – so easy! This does not taste like regular cow’s milk cream, but has a lovely flavor all its own. I love that is has 141% of your vitamin A, 70% of your vitamin C, and 7% of your daily value of iron. Do you have vegans come over on Thanksgiving? What do you feed them? In a large skillet (with a lid), heat oil over medium high. Saute onion and garlic until softened. Add spinach, stir, and cover for about three minutes to help the spinach wilt. 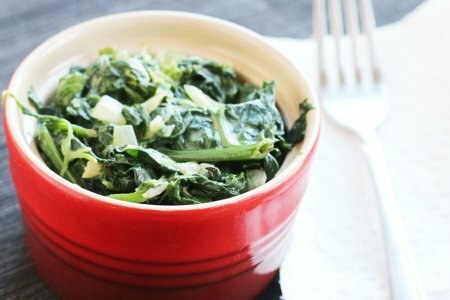 When spinach cooks down, add coconut milk and salt to taste. My son in law is vegan all the way.. This sounds good but can I use almond milk in place of coconut milk?? Well this looks like a good dish to bring to my friend's thanksgiving dinner. She has a couple of friends that are vegetarian,not vegan, but you know it'll be great to bring. Yummers! 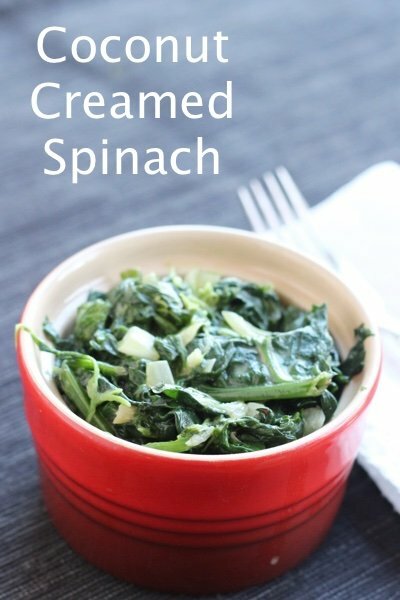 Two of my favorites combined...spinach and coconut milk! Definitely going to try this recipe! Love the way it's sparked up with garlic and crushed red pepper. @Annie - I think it wouldn't work. Almond milk isn't as CREAMY as coconut so it might just fall flat. Thanks for your question! For those of us who have never purchased coconut milk. Is that found in the diary section? Do I buy unsweetened? Thanks for your help. I would like to make this with dinner tonight. @Teresa - it is found in the Asian section next to the Thai sauces and spice pastes. I hope your store has an Asian section. Great question! My daughter's boyfriend is vegan, and while he is not coming for Thanksgiving, he is coming for Christmas - I serve lasagna on Christmas Eve, and Chicken Cordon Bleu on Christmas. So, yeah, there will be adjustments this year. Patti, I hope you come back because I have a great recipe for vegan lasagna. For the ricotta, use this: http://www.thatwasvegan.com/2012/02/22/the-best-tofu-ricotta/. For the mozzarella, use this: http://www.onegreenplanet.org/vegan-recipe/how-to-make-fresh-vegan-moxarella-cheese/. It tastes amazing, and even omnivores love it. Thanks so much Stefanie! I was talking with my daughter over Thanksgiving, and we discussed just this issue. This helps a lot! !